Since September 11 2001, an atheist who would previously have been described as "leftist" (or "liberal" if they were American) found that they were suddenly cast as "right-wing" or "far-right" and "racist" if their criticism of religion included criticism of Islam. This essay is written because I am impelled, whether I like it or not, to demonstrate how those who uncritically support the "Palestinian" cause against Israel unavoidably come to expose their own racism and augment the historical racism which continues to call for the genocide of Jews. Hitler called for such a genocide in the name of Christianity, and the contemporary (political) left support the same call being made in the name of the religion of Islam. In 2009 in an art exhibition Humanist Transhumanist I criticised religion-derived values and quoted from religious doctrine - the New Testament, Old Testament, Koran - arguing that we must arrive at our human values by the application of reason. I was called "racist" because I quoted the Koran, apparently because it is insensitive to the cause of "Palestinians" where "Palestine", Israel, or the conflict in the Levant was never mentioned. 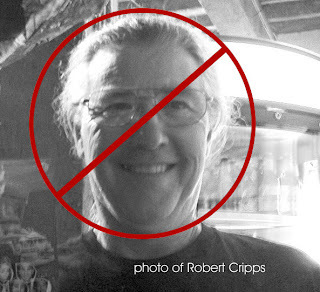 The gallery owner who called me "racist", Robert Cripps, subsequently decided to sue me for defamation because I wrote about what he did to myself and co-exhibitor, and the actions that he used against us based on his claim of "racism" that were used as an excuse for a rescission of the contract I had with his gallery. Robert Cripps above, who ran the failed GLG, realised and accepted he was racist to hate Jews ("self-confessed racist" means just that). He preferred to call me "racist" in my critique of Islamic doctrine (the Koran) because he preferred to blame "the Jews and their state in Palestine" for a conflict that was not mentioned in my criticism of religions. Supporters of the "Palestinian cause" call "racist" any critic of Islam - as they did recently in Melbourne, Australia, when they organised pro-"Palestine" protests against a critic of Islamic doctrine. The Students for Palestine champion the cause of "Palestinians", a people who are defined as Arab by race and Muslim by religion. In support of a Muslim Arab cause, "Palestine", it becomes a corollary to condemn any critic of Islam, even where "Palestine" is not mentioned. Islamic doctrine guides the actions of "Palestinians". Hamas states this categorically in the 1988 Covenant, and still acts according to its Covenant. Islamic doctrine promises the land from Yemen to Syria to Muslims (hadith). Islam's goal is that the entire world is to one day be Muslim (Koran + hadith). Islamic doctrine demands the genocide of the Jews (hadith). Genocide, a quest aspired by Islam is criminal. Since 1951 Genocide has been recognised as crime against humanity. "The Convention on the Prevention and Punishment of the Crime of Genocide was adopted by the United Nations General Assembly on 9 December 1948 as General Assembly Resolution 260. The Convention entered into force on 12 January 1951." 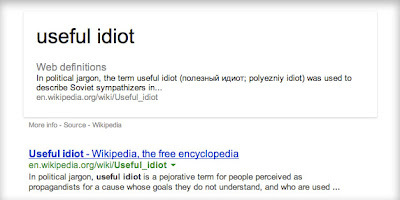 (Wikipedia quote. The 1948 resolution is available on the UN website). Article 18 of the Universal Declaration of Human Rights protects freedom of religion. - unhindered right to observe one's religion which includes the committing of genocide guaranteed by the UN? - or the right not to be exterminated, also guaranteed by the UN? To prevent the "conundrum" it is far easier to call critics of Islam racist so that you do not have to be called to adjudicate, or be compelled to have to legislate and impose a restriction to religious worship, which includes the right to commit genocide, since this is part of the religion. When hadith calling for genocide against the Jews are referred to it is apparently not Islam that is racist, but who-ever brings Islam to the attention of another! Sahih Muslim Book 041, Hadith Number 6985. "The last hour would not come unless the Muslims will fight against the Jews and the Muslims would kill them until the Jews would hide themselves behind a stone or a tree and a stone or a tree would say: Muslim, or the servant of Allah, there is a Jew behind me; come and kill him." Groups such as Students for Palestine would rather you were unaware of this hadith. 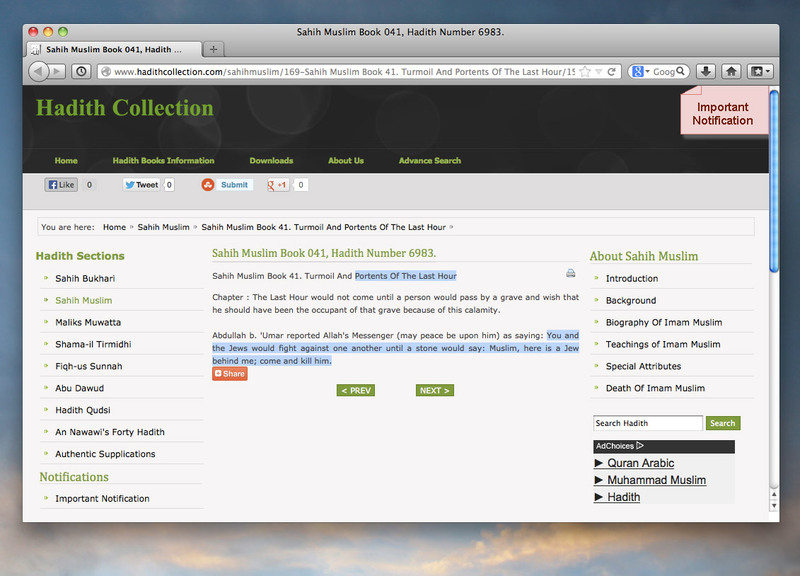 This hadith guides Muslim actions against Jews, is part of the Hamas Covenant, and was lauded as the goal of Islam by Australia's current Mufti in December 2012. Islam is the basis of a religious hatred of all Jews, and Islam is the basis of a unilaterally declared war against Israel. Knowledge of Islam has to be excised from the context of any debate regarding “Palestine”, in order to blame Israel. Even critics who do not refer to "Palestine" are called "racist" for criticising doctrine because such criticism affects perceptions of which party is in the wrong regarding conflict in "Palestine". Condemning critics of Islam is a necessity for those who support "Palestinians". Supporters of "Palestinians" seek to prevent knowledge of Islam's call for the genocide of Jews so that they can blame Jews. And any critic of Islam is, by this necessity, denigrated in order to silence them. Any mention of the Koran or the hadith, that show unambiguously the Islamic intentions behind what is a unilaterally declared Muslim religious war against Jews, is suppressed. Anyone who supports the Palestinian cause is a racist, because the cause they support is racist. 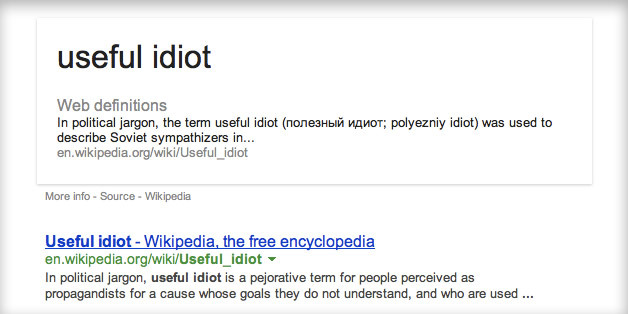 And any of the few Jews who might believe they are doing some good by supporting the “Palestinian” cause because they uncritically accept the argument that only the Jews can be blamed, are simply useful idiots. Supporters of "Palestine" criticise critics of Islam because such a critic can demonstrate incontrovertibly that the calls for genocide are an inexorable component of Islam, and central to what it is to be Muslim. After-all, for Islam, the dead will be raised only after the complete genocide of the Jews. However, to justify their racism against Jews knowledge of Islam has to be suppressed so that war in "Palestine" can then be blamed on the victims of the violence, the Jews. That is: Islam's objective is predicated on, and can only be achieved by, the total extermination of Jews. This is immediately obvious in Islamic doctrine. So any criticism of Islam has to be suppressed in order to blame the victims of Islam's war against them, the Jews. The Koran is no mere holy book, it, along with the hadith is law; religious obligations required of all Muslims to submit to. Islam means submission. Proof of submission takes the form of acting on the demands made, whether they be calls to beat a disobedient wife, or calls for the genocide of the Jews. 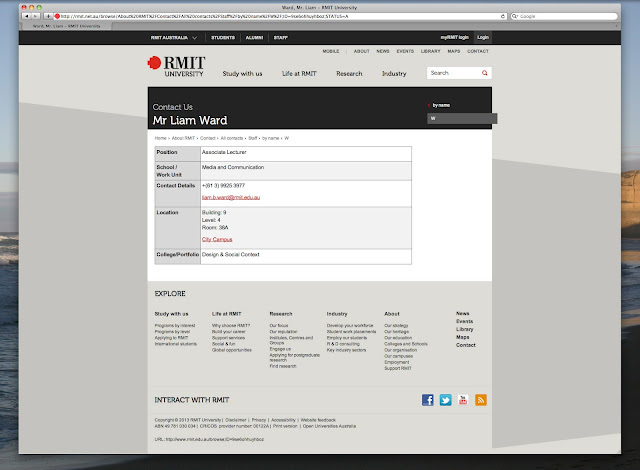 Screenshot of Melbourne University law course; study of the hadith is a subject of law, not religion. 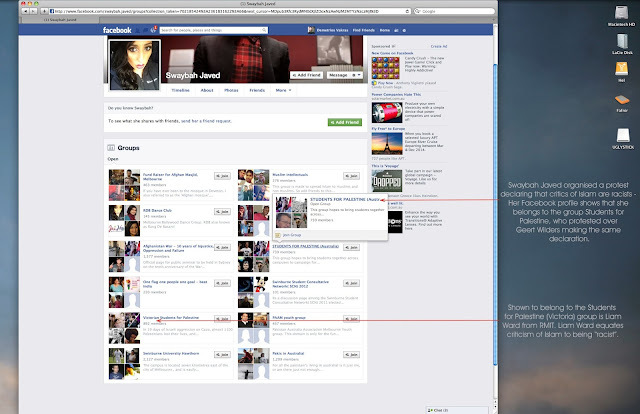 This page has been altered since I took this screenshot in January 2013. 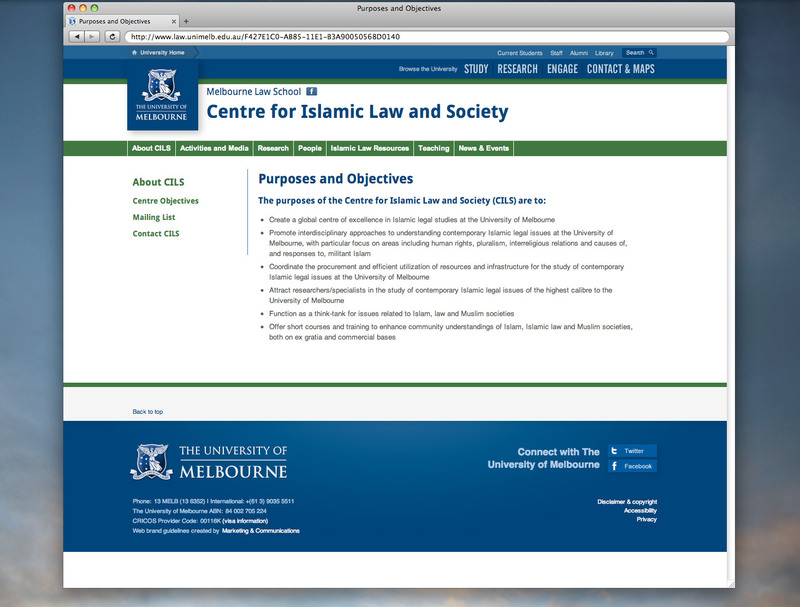 Melbourne University now teach the hadith as "Indonesian Law". 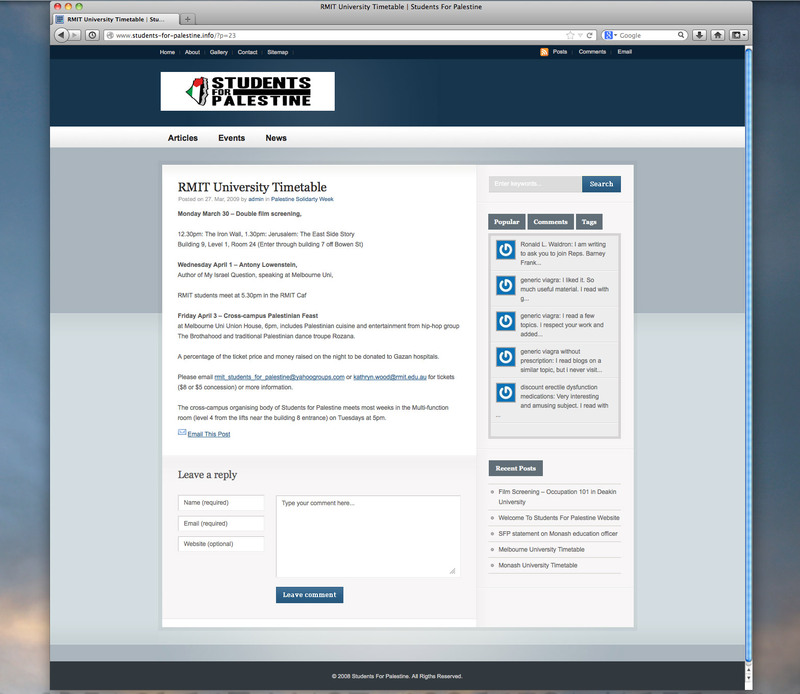 Students for Palestine advocate, as do those whose cause they champion, the "Palestinians", the elimination of Jews. By what means? expulsion? or extermination? or are they to simply vanish? (About) a month prior to our exhibiting at Cripps failed GLG in 2009, the Students for Palestine marched, in a protest organised at RMIT, an institution with which Cripps' gallery had extensive dealings. 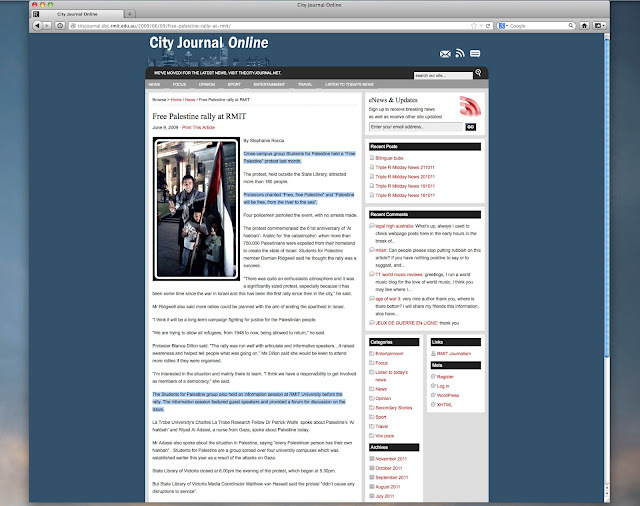 In 2009 Students for Palestine made the same call as did Hamas, the elimination of Israel. The call made was "Palestine from the river to the sea". Where to the Jews? This call, like Hitler's, leaves nothing to speculation, their call is to make "Palestine" Judenfrei. Students for Palestine organised an "Free Palestine" protest just prior to our exhibition at GLG in 2009. Organised at RMIT the protest called for the elimination of Israel. 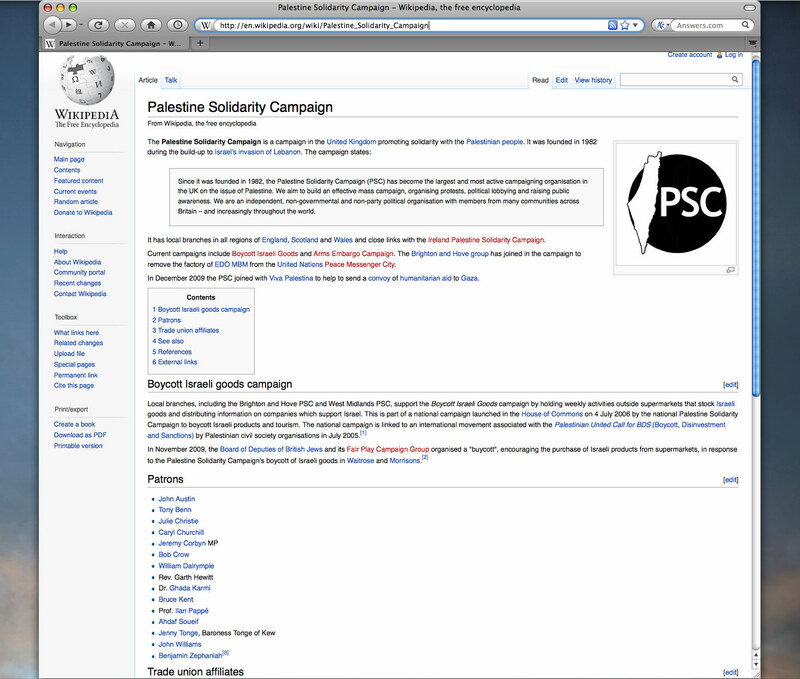 The Students for Palestine RMIT page, months before our GLG exhibition in 2009 organising for a pro-Palestine protest. Their logo eliminates Israel and shows "Palestine" in its place. 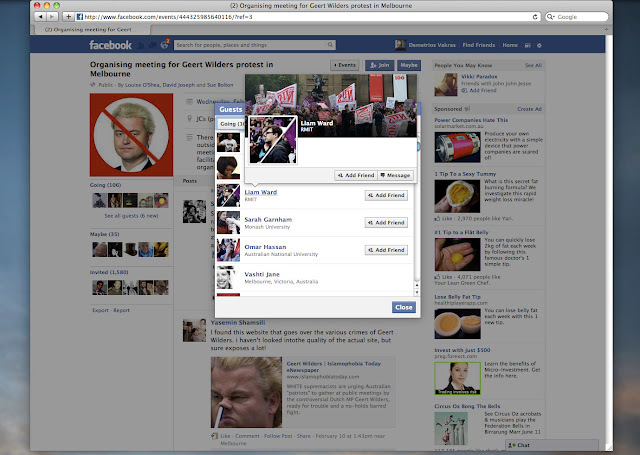 Liam Ward, an academic from RMIT, posts that he is going to a protest organised by Students for Palestine against Geert Wilders a critic of Islamic doctrine, in 2013. "[Muslims are] vilified and oppressed groups in contemporary Australia, and were essentially fighting for the very right to be Muslims…In the context... of … the anti-Muslim bigotry of the ‘war on terror’ … The campaign [for prayer rooms] also highlighted dangerous weaknesses in much of the left’s understanding of anti-Muslim racism. … Islamophobia justifies Western imperialism and creates domestic scapegoats for capitalism’s problems… Islamophobia can turn even self-identified Marxists into apologists for the anti-Muslim vitriol that is today a mainstay of Western ruling class propaganda." Liam Ward, pictured above, claims it is "Islamophobic" (a fear without rational basis) that RMIT had not provided Muslims with adequate prayer rooms; claims that any view critical of Islam is "anti-Muslim racism"; and supports a protest against Israel, in order to defend "Palestine" when Islamic doctrine - which has nothing to do with Israel - is criticised. be obliged to provide any religious facilities at all. For anyone." 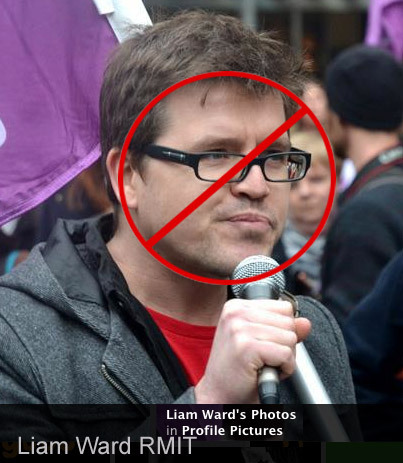 Liam Ward is a member of the (Victorian) Facebook group Students for Palestine. 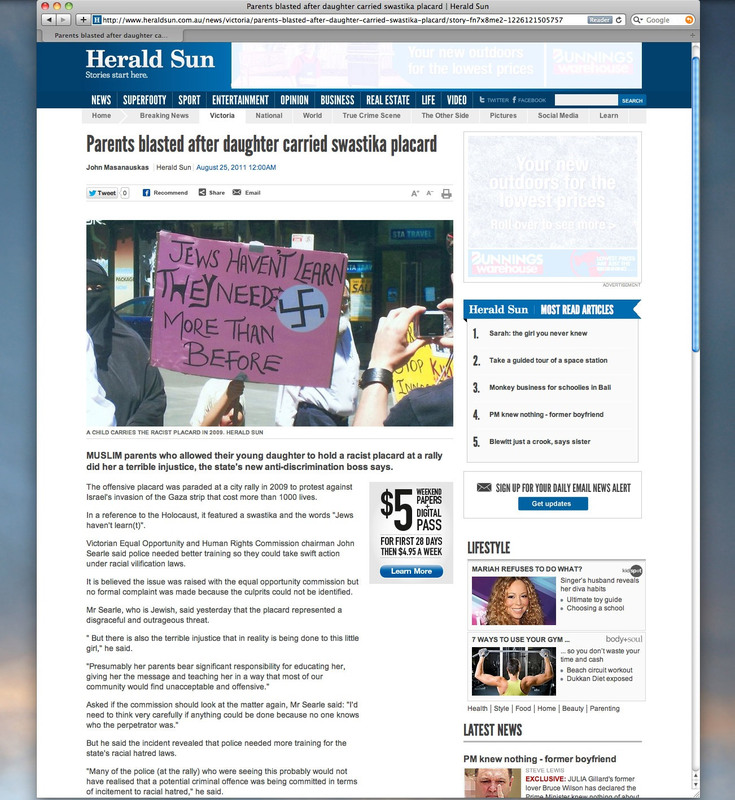 Above, the Facebook profile of Swaybah Javed who organised a protest in Melbourne against what she declared as being "racist" and "Islamophobic" (a fear without rational basis) police arrests of violent Muslim demonstrators in Sydney. Both Swaybah Javed and Liam Ward are members of this group which associates criticism of Islam to be "Zionist" and racist. University academics of pre-Nazi Germany made the hatred of Jews respectable; it was these hatreds that Hitler expressed in Mein Kampf; and it is these hatreds expressed by Hitler in Mein Kampf that motivate the left today. And it is university academics and students who make an irrational racist hatred of Jews "respectable". There were an extraordinary number of exhibitions held at GLG run by Robert Cripps that were official RMIT functions - RMIT being where Peter Cripps, brother of Robert Cripps, works. 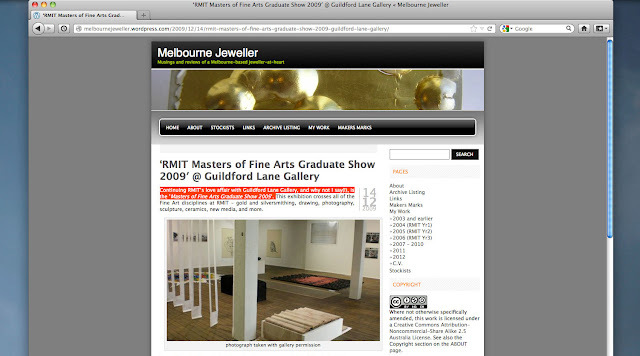 The link between RMIT & GLG was not noticed by us alone as the above article illustrates (I am compiling a page on the many RMIT links to GLG - the links between both are overwhelmingly extensive). Both Peter Cripps and Robert Cripps have worked together in the past, as was communicated to James Gleeson by Peter Cripps in a past interview for the ANG (transcript of the interview available from ANG as a pdf). Wether Liam Ward and the Cripps brothers ever communicated with one-another is not known. RMIT includes among its academics those who act for Palestinian causes and who actively campaign against critics of Islam. That Robert Cripps expressed a view identical to this could be purely coincidental! Early 2013. The Students for Palestine continue with the same logo used in 2009: their Facebook page includes a map of "Palestine"; a map of the British mandate of Palestine. There is no Israel. It is a map showing, to use the Nazi term, a "Palestine" that is Judenrein, cleansed of Jews, where only "Palestinians" remain. The objective of "eliminating" the Jews from "Palestine" symbolised by maps showing it and no Israel is not isolated to Australia. 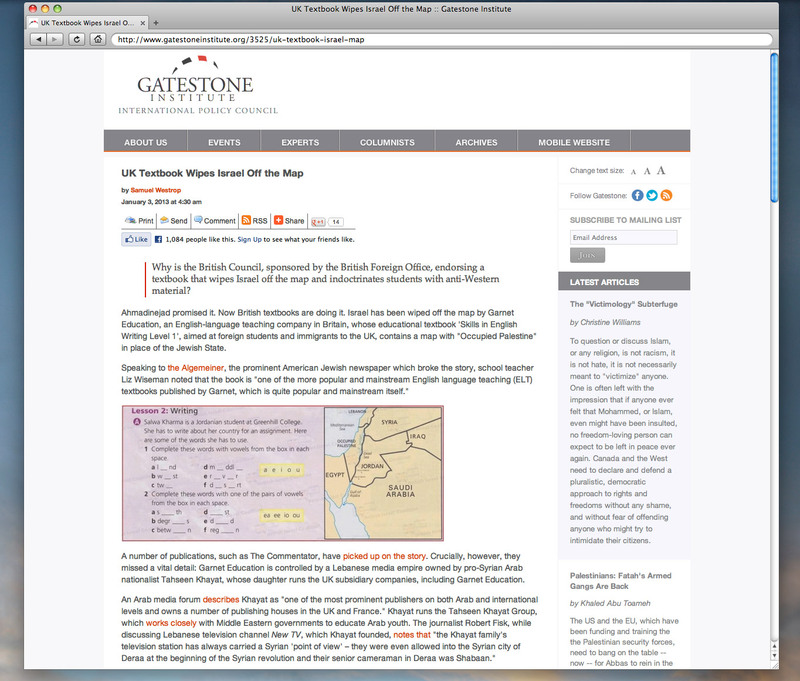 In 2012 a British history book included a map of the levant in which "Occupied Palestine" is shown in place of Israel. On 18/6/2009 Robert Cripps complained about the Jews creation of their state in Palestine, not "occupied territories" (there is a distinction). The map in the British school-book sums up what Cripps meant and how I and Lee-Anne understood it. It was never a claim of the "Occupied territories". Screenshot of one of the articles excoriating the British government funded racism. The British Council funded the book that included the map showing "Occupied Palestine". Disingenuously, the British Council came out with typical Anglo-speak - to distance themselves from that they endorse. The map showing only "Palestine" was roundly condemned as racist. Even the publishers apologised, sort-of, but somehow absolved themselves of blame and claimed that it was because of some "miracle" (an inexplicable happening, possibly by the will of Allah?). Students for Palestine, at the time of my writing this piece (March-June 2013), posted entries on Facebook (above). In a meeting between a Hamas spokesperson and Ahmadinejad, both advocate a of war of annihilation against "the Zionists", Israel, and concede that this war is a religious war. The proclamation that this is a war waged on religious grounds - Islam - is consistent with Islamic doctrine (Koran and hadith) and the Hamas Covenant. Despite this, it is the Jews, vicitms of Islam's war, who are blamed for the conflict because criticism of Islam is being deemed "racist". 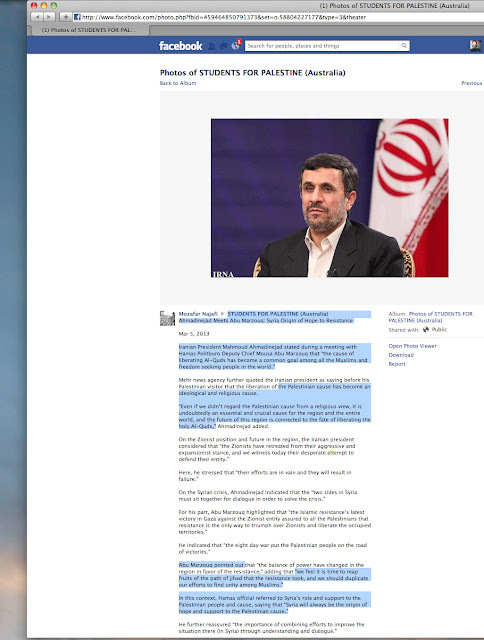 Some years earlier, Kevin Rudd, then Prime Minister of Australia, was seeking to have Ahmadinejad charged for inciting war crimes, genocide. So, what's the excuse for the Students for Palestine? who make the same call for a Jew-free "Palestine" with impunity, and support their demand by using the same map where a "Palestine" exists in place of Israel? but who then claim that they are not advocating the elimination of Jews, just the rights of Palestinians? 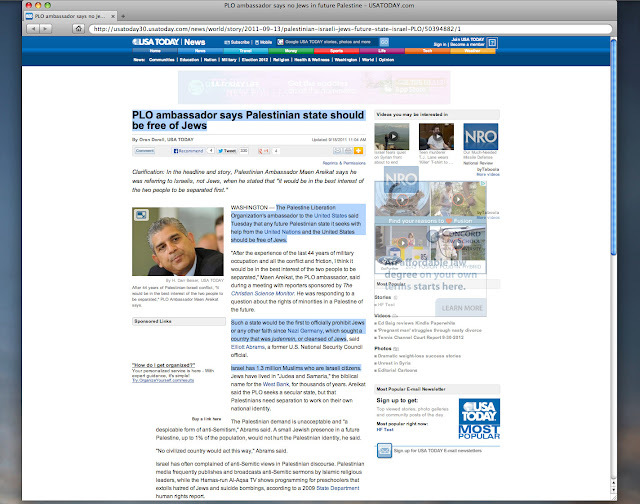 But the rights of "Palestinians" to do what? expel the Jews? exterminate the Jews? make the land Judenfrei? and all the while they can blame it all on Jews by keeping suppressed that the "Palestinian" motive is Islam, (in the same way that HItler's motive was Christian)? which demands as a compulsory religious obligation that one commit genocide of the Jews? And this they achieve by calling critics of Islam "racist", even critics who do not reference the conflict in "Palestine". Suppressing criticism of Islam is intended to achieve one thing: maintain racism against Jews. In 2013, the Students for Palestine organised a protest against Geert Wilders. Wilders criticised Islamic doctrine. 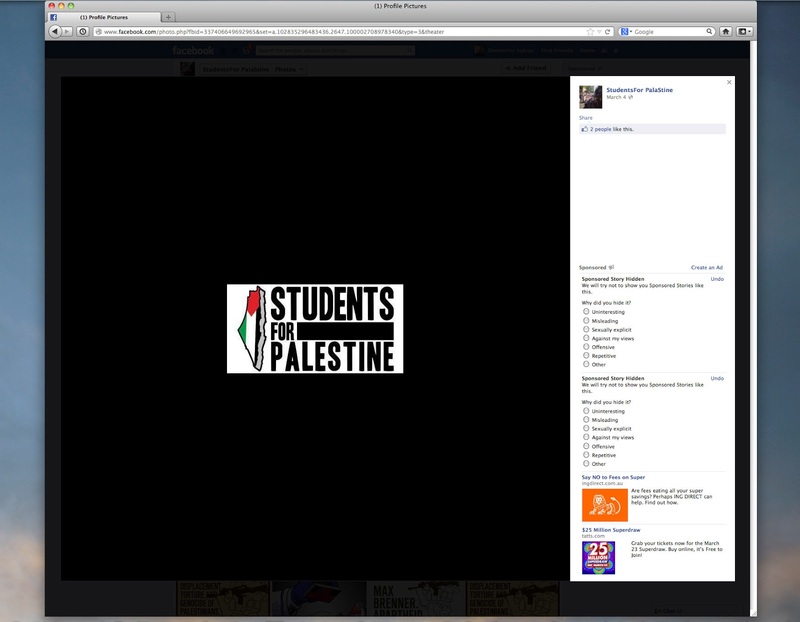 To justify their own racist hatred of Jews, the Students for Palestine called racist anyone who criticises Islam. It is a necessity for those who support the "Palestinian" cause to prevent assessment of Islamic doctrine, because Islamic doctrine - the Koran and hadith- expose a war waged unilaterally against Jews. If they fail to restrict references to the Koran or the hadith, groups such as Students for Palestine will be exposed for what they are; dupes, racists, propagandists for hatred.